The Score Sportsbook 2019: What Can We Expect? This sportsbook does not yet operate in NJ. Be sure to check back soon to see its welcome offers and bonuses. Gaining a huge array of fans with their mobile sports app, theScore is now ready to launch an online sportsbook. Becoming the first media company to do so in the process, there are great expectations surrounding theScore Sportsbook and what’s to come in the future. In this review, we’re going to look at what we can expect this sportsbook to offer to New Jersey customers. Is there a promo code available? What sports can we bet on here? Let’s find out. The brand started life as a sports information site. Debuting their mobile app in 2007, theScore has earned fans with their latest sports news and up-to-date scores and fixtures. The Canadian-based company is now looking to open a Sportsbook online and on mobile. The expected date for theScore sportsbook is mid-2019, after teaming up with Bet.Works and Monmouth Park race track in New Jersey. Social media has played a huge part in their success. Tens of millions of fans access their dedicated site and mobile app or follow their social media platforms. Of course, we’re not expecting this number of people to sign up to theScore sportsbook NJ, but it’s a good indication of how revered the company is in North America. We think The Score Sportsbook in New Jersey will prove popular with bettors in the State. They’ve gained a fantastic reputation with their sports app, with over 4 million downloads, and so current users are excited about what’s to come. The Score sportsbook NJ should be similar to those online sportsbooks already available in the Garden State. We’re expecting this bookie to offer a good deal of sports and events to bet on, like soon-to-be competitors DraftKings and FanDuel. If you’re new to betting online, you might be a little nervous about how you can place a bet. In reality, it’s pretty simple to place wagers and fund a betting account. Let’s look at an example. We’ll use golf for our example. Let’s say you wanted to bet on Tiger Woods to win the US Masters. Scroll through the list of sports and find the Golf tab. From here, you can select which tournament or event you want. So, we hit the US Masters tab. In the Outright market, we see odds of +1200 for Woods to be victorious. Click on the odds and this will be transferred to your online betting slip. On your betting slip, you will see your choice and a box in which to enter your stake. Enter here how much you want to place on your wager. Push the Place Bet button and you’re done! Let’s say you place $10 on Woods to win. If you’re successful, you’ll win $130–$120 in winnings and your $10 stake back. If Woods fails to win, you lose your bet. We expect theScore sportsbook New Jersey to offer a vast array of markets. We also hope that a Live Betting service will be available. This function enables you to bet on the action as it happens, which can provide a more exhilarating online betting experience. The Score sportsbook New Jersey will be looking to attract new customers in huge numbers. One way they will attempt to do this is to offer welcome bonuses and promo codes. What kind of promo codes will the Score Sportsbook NJ offer you? Let’s explore the possibilities. Firstly, it’s most likely that theScore Sportsbook will have a welcome bonus available. Other NJ sportsbooks have welcome offers consisting of risk-free bets, matched first bets and deposit bonuses. Next up, it’s likely there will be offering sports-specific promotions. So, on major events such as the Super Bowl, expect enhanced odds or risk-free bet opportunities for new and existing customers. We’ll take a closer look at the setup of theScore NJ and what the partnerships they’ve formed entail. Their land-based partner is the racetrack Monmouth Park in New Jersey. The partnership has been signed to last for up to 15 years, split into three five-year terms. The Sportsbook has also signed up with Bet.Works. Bet.Works are due to provide the platform and services to get the online sportsbook up and running. It’s thought that theScore Sportsbook New Jersey will go live in the middle of 2019. The Sportsbook has yet to receive a license from the NJ Division of Gaming Enforcement or the New Jersey Racing Commission, but it’s very likely this will be approved in the near future. Exciting times ahead, it seems, with a new New Jersey sportsbook on the horizon. A favorite with sports fans in general, we’re expecting theScore NJ Sportsbook to attract a huge number of betting fans too. It’s clear that this Sportsbook is hoping to be here in the long-term. There are already plans in place to release online betting apps in other states, once legislation and licenses have been awarded. They have certainly got plans to become the number one Sportsbook in New Jersey in 2019. 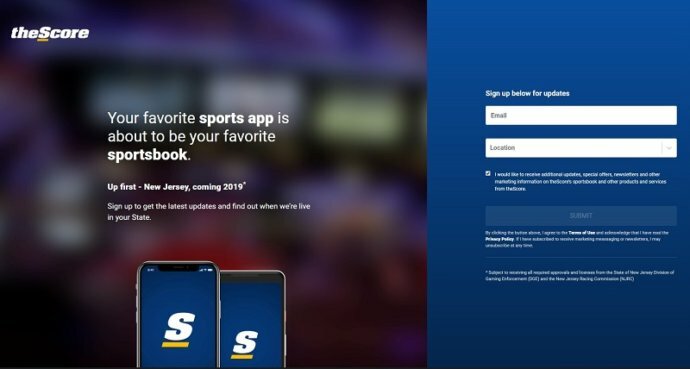 With a huge number of fans already signed up to their sports information app, it’s looking likely that their Sportsbook will be leading the way in the near future.